Last week, the commodity market was very sensitive to the news about the Forties pipeline system breakdown and the fact that the pipeline had to be closed for maintenance. Brent reached the local high at 65.83 USD per barrel. However, after a couple of days this “bullish frenzy” died down and investors started analyzing the situation. It became quite clear why Brent was rising so fast, WTI was behind, and what was the reason of all this. The Forties pipeline is very important for the United Kingdom and the oil extraction in the North Sea in general. In fact, it’s the only way to transport northern oil to the continent. At first, there was information about a small crack in the pipeline, which resulted in a spillage. It was assumed that the problem might be resolved by reducing the pressure the pipe section where the crack had been detected. However, this plan didn’t work, the crack got bigger, and the pipeline had to be closed for unscheduled maintenance. Brent’s response to this was pretty obvious. Forties is one of the BFOE and influences the total Brent price. First of all, the cost of Brent is some kind of a baseline for the Middle East countries for pricing their own oil. This pricing policy is quite complicated, but it’s clearly seen that all parts of this chain are closely connected. Hence the reactions that were seen last week. The Forties pipeline system maintenance will last about two weeks, considering that it is empty for already a week. They are planning to get it back to operation by New Year, and that’s when the price of Brent will exclude the risk factor. Last Friday’s statistics on the Oil Rigs changes in the USA from Baker Hughes showed the decrease by 1 unit and didn’t attract much attention. The components of the report indicated that the number of gas rigs increased by 3 units and the number of oil rigs decreased by 4. There is nothing really surprising in this, it’s quite usual. This year, the number of rigs has expanded by one third, and this is what really should be taken into account when analyzing this indicator. 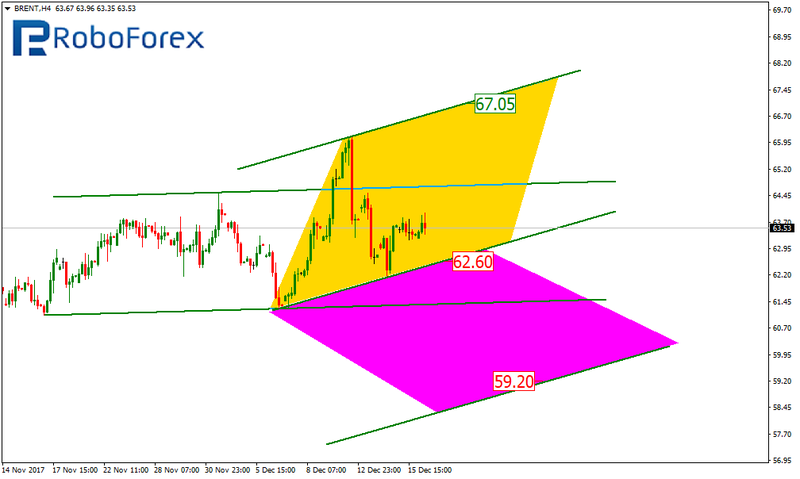 From the technical point of view, the chart of Brent is quite mixed, but very interesting. After breaking the resistance line of the previous channel, the price moved back, and reached a new low, which may start a new rising channel. The upside target may be the resistance line at 67.05. However, we should ignore a possibility that the downtrend may yet continue. If the price breaks the support line of the current trend channel and fixes below 62.60, it may fall towards the projected support line at 59.20.